This beautiful piece will provide a warm and classy touch to your home decor without blocking the sun light. Glass: For this piece we used clear baroque and clear crystal ice with waterglass. The color sections were created in Medium amber, olive green and ruby red. 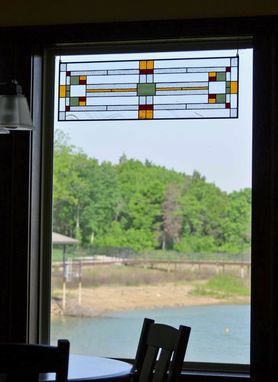 This stylish and elegant transom window is already decorating our customer's home. Don't miss the opportunity of having one embellishing yours!!! This company provided the best customer experience that I have ever received for any service EVER! I was considering purchasing pre-made stained glass panels and "making them work." What a mistake that would have been. I was able to work with them to get the EXACT design, color and size windows I wanted, for a better price! They did make one error which was IMMEDIATELY corrected with ZERO questions asked, at no additional cost. If you are thinking about a stained glass project, this is your vendor. I realize I sound like I was compensated in some way for this review, but I was not, unless you consider receiving a great product for a great price compensation. LOL. Excellent experience. Exchanged design concepts through email, selected a version, built and shipped in a timely fashion. Product arrived in a well protected package, as advertised and looks great. I already have some ideas for another project for Donna. We just received our two glass panels and are extremely happy with them! This experience was so pleasing and painless, Thank you! !